A 41-year-old woman presented to her oncologist with a focal, rapidly enlarging, firm, right midforearm soft tissue volar mass. The lesion was not painful, and the forearm was not tender. There was no history of trauma. The patient had a remote history of breast cancer, which had been treated with mastectomy. 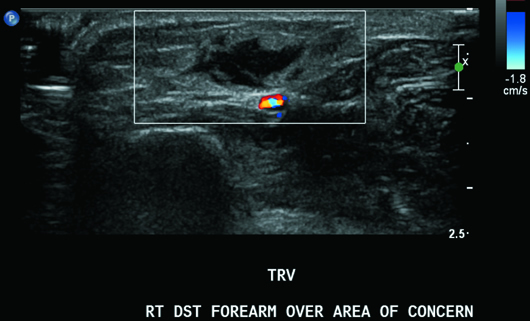 The patient underwent a targeted ultrasound of the volar soft tissues of her right forearm and a subsequent ultrasound-guided percutaneous biopsy using a 16-gauge Temno needle. 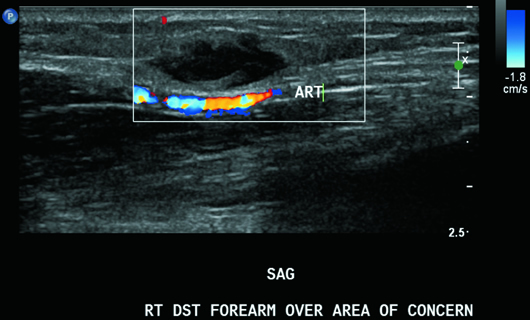 On targeted ultrasound, the palpable right volar forearm abnormality correlated with a 1.7 cm circumscribed but irregular, predominantly hypoechoic, subcutaneous focal mass without deeper extension into the muscle plane or vascular involvement (Figures 1, 2, and 3). The diagnosis of nodular fasciitis was confirmed histopathologically, based on the percutaneous biopsy specimen. Nodular fasciitis is a rapidly growing, nonneoplastic soft tissue mass that is frequently located in the deep subcutaneous region or in the fascia. The most common locations for nodular fasciitis include the volar aspect of the forearm (45%), lower extremities (16%), head/neck (18%), and chest/back. Nodular fasciitis is considered a reactive proliferation of myofibroblasts presenting as a rapidly enlarging soft tissue mass. The most important pathological differential diagnosis of nodular fasciitis is a soft tissue sarcoma. In fact, this is the most common benign condition misdiagnosed as sarcoma. Clinically, nodular fasciitis can also mimic a sarcoma. Ultrasound and MRI imaging offer an accurate assessment as to the plane of involvement, soft tissue extension, and the characteristics of the lesion, thereby suggesting the benign nature of the lesion. Making a correct diagnosis of nodular fasciitis is important because of its seemingly alarming resemblance to a sarcoma. The other important close differential diagnosis is fibromatosis. Schwannoma is still another differential consideration. Other differential diagnoses, although less common, include a solitary fibrous tumor and dermatofibrosarcoma protuberans. 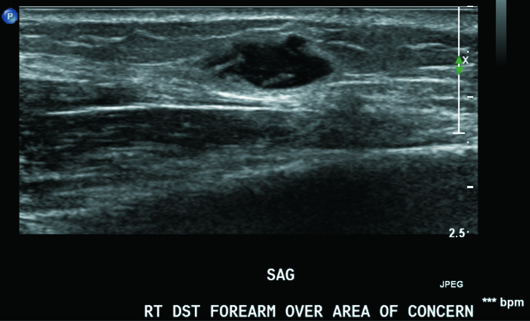 On ultrasound, nodular fasciitis typically presents as a well-defined isoechoic to hypoechoic mass with mildly increased vascular flow in the deep portion of the subcutaneous fat layer, adjacent to or in the fascia, as seen in this case. • Hypercellular lesions appear nearly isointense to skeletal muscle on T1WI and hyperintense to adipose tissue on T2WI. • Highly collagenous lesions demonstrate hypointense signal on all sequences. • Contrast enhancement is typically diffuse but may be peripheral. 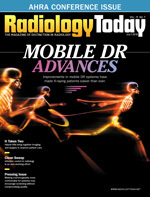 Imaging-based diagnosis should be verified with a percutaneous or excisional biopsy. Establishing the diagnosis cytologically can be challenging. For more precision in diagnosis, immunocytochemical stains should be used. Treatment can consist of marginal excision of the lesion. These lesions usually do not recur. Several weeks of observation after a tissue diagnosis have also been advocated, given the self-limited course of the disease. Spontaneous regression and involution of lesions within two to 16 weeks or in response to steroid injections have been reported. Several case reports describe the development of nodular fasciitis as a paraneoplastic phenomenon coexisting with different neoplasms, including gynecologic malignancies (ovarian and fallopian tube cancers), pancreatic adenocarcinoma, lung carcinoma, breast carcinoma, prostate carcinoma, gastric cancer, colon cancer, transitional cell carcinomas of the urinary tract, carcinoma of unknown origin, and hematologic malignancies. 1. Bernstein KE, Lattes R. Nodular (pseudosarcomatous) fasciitis, a nonrecurrent lesion: clinicopathologic study of 134 cases. Cancer. 1982;49(8):1668-1678. 2. Rankin G, Kuschner SH, Gellman H. Nodular fasciitis: a rapidly growing tumor of the hand. J Hand Surg Am. 1991;16(5):791-795. 3. Shimizu S, Hashimoto H, Enjoji M. Nodular fasciitis: an analysis of 250 patients. Pathology. 1984;16(2):161-166. 4. Medsger TA, Dixon JA, Garwood VF. Palmar fasciitis and polyarthritis associated with ovarian carcinoma. Ann Intern Med. 1982;96(4):424-431.